The old line "That's Greek to me." 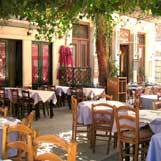 might apply to the names of things you'll see on a menu, but not to the familiar and delicious food you'll eat while you are in Greece. Appetizers (mezédhes) are eaten at any time of the day. They are usually served family style and may be hot or cold. Some of the most popular include dolmáldes (grape leaves stuffed with rice, currants and pine nuts), melitzanosalata (grilled eggplant and herb puree), taramosaláta (fish roe and potato puree), spanokopita (flaky pastries stuffed with spinach and feta cheese) and tzadziki (dip made from yogurt, cucumber, garlic and mint). Also served as appetizers are plates of kalamaria (deep fried squid) and oktopodi (marinated octopus). The typical Greek salad (choriátiki) is a mix of cucumbers, red onions, tomatoes, olives, feta cheese and olive oil sometimes dressed with capers and lemon. Bread (psomí) will be served with most of these and with most meals as well. Fish - (psári) or any other seafood is a staple of the Greek diet. The fisherman is revered, and it is a valued profession. In many restaurants the fish will be on display on ice or in a glass case so that you can choose which one you'd like. (In this case the fish is prepared and served whole.) The most popular fish are barbouni (red mullet) or ksifias (swordfish). The price is determined by the weight of the fish. For smaller portions and budgets, enjoy a fish appetizer dishes such as marídhes (pan fried smelt). Meat - Lamb (arní) is the most common meat in Greece and you will find it grilled, roasted or cooked on a spit. Souvláki (Shish kebab) is often pork but may also be beef, chicken or lamb, and is very popular. Try keftédes a savory fried meatball or the traditional meat dish called kléftiko. It is a meal of goat meat foil wrapped with potatoes and vegetables and baked. Yogurt - Yogurt is very popular in Greece and it is quite delicious, even taking the place of dessert. As the yogurt is made it is hung in cheesecloth to drain off excess moisture. The result is a very firm creamy consistency - so much so that you may confuse bowls of it on a breakfast buffet to be cream cheese or whipped cream. It is often topped with dark honey, fruit or nuts. There are "milk shops" like ice cream shops which serve it to be eaten there or taken home. Flavors and Ingredients - Other popular food items that will be common in Greece include mint, dill, lemons, tomatoes, lentils, rice, cheese (not just Feta), many kinds of olives, fresh figs, sesame seeds and pistachios. Coffee / Juices - Traditional Greek coffee is similar to Turkish coffee, served in a small cup with some residue at the bottom. Each cup is prepared in a long handled pot with very fine grounds, sugar and water brought to a boil at the same time. This Greek coffee is always served with a glass of water. In tourist areas and hotels, espresso, cappuccino and American style coffee will be available. The Greeks enjoy a drink called frappé a cold coffee drink made with instant Nescafe and milk served throughout the day in the warm summer months. Fresh squeezed juices served in tall glasses are popular. Wines - Wines are made throughout much of Greece, but the most traditional is the white Retsina. It has a distinct flavor with a hint of pine resin. For many people it is a love it or hate it taste. Some claim it tastes like Pine Sol or turpentine. Other popular whites include Boutari and Cambas, which come from the island of Santorini. The island of Crete is also known for a variety of good red wines. The most popular Greek beer is Mythos, which has a light-bodied taste. Aperitifs - Ouzo is by far the most popular aperitif in Greece and it has a strong anise-flavor (licorice). This liqueur is served with a small glass of ice water, and when the two are combined they form a cloudy refreshing drink. Try it before or after a meal or by itself on a hot day. It is very common to have an ouzo as you enjoy appetizers.